Movement Review: What is Trigger Point Dry Needling? 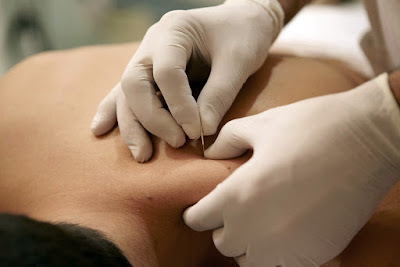 Trigger Point Dry Needling (TDN) is a physical therapy treatment technique that utilizes thin filament needles to make changes in myofascial trigger points. Myofascial trigger points can contribute to pain and decreased muscles function. TDN is an effective tool in the hands of a physical therapist who manages soft tissue injuries, disorders, or pain. TDN utilizes very fine acupuncture needs to "shut down" painful areas in muscles. This causes the muscles to briefly contract and then produce immediate and long lasting relaxation. TDN is particularly effective when used as part of manual physical therapy treatment approach. TDN is used only to augment evidence based therapy and does not replace it. Often, TDN allows patients to more effectively perform their therapy exercises. Allows patients to perform daily tasks, attend work, and participate in normal activities without pain. Initial responses are often seen immediately. During treatment patients may feel a cramping sensation, but then feel immediate improvement of their symptoms. TDN can significantly decrease or completely reduce spontaneous electrical activity causing muscle dysfunction TDN has been shown to improve range of motion, decrease pain, and improve muscle function.